Eric Robson and the panel are in Glasgow. Christine Walkden, Neil Porteus and Bob Flowerdew answer the horticultural questions. This week, the panellists debate how to keep slugs out of the kitchen, the best composters, and reducing plastic use in the garden. They also diagnose a sickly Camellia, advise on propagating a Daphne Bholua, and suggest the best long-life cut flowers. Q – I have slugs constantly coming in my kitchen, how do I stop this from happening? Bob – Use salt. Don’t pour it on them, that’s cruel, but they will avoid it if it’s on the ground. They don’t like powder. Q – I need a new composter; which type is best? Neil – I go low-tech and lay palettes with sticks on top and then layer up from there. Keep turning it and you’ll get great compost even within eighteen-months. Christine – Keep it simple. And remember the more compost you have the easier it is, and if it gets dry in the summer you should water it. Q – How can we reduce our use of plastic in the garden? Christine – Reuse the pots yourself. And use other things like tin cans that are already in the house. Neil – You can buy Miscanthus/’Elephant grass’ and you can buy rice and bamboo pots. Christine – It’s competing against the Wisteria for one. If they’re both growing badly look at the soil and the environment. 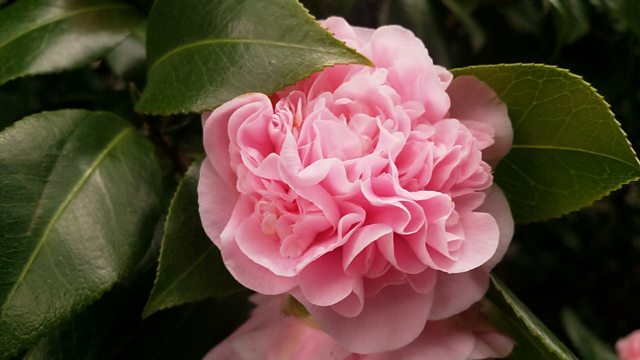 Bob – Give it a dose of potash (not wood ash on a Camellia as it’s too limey). Christine – Make sure the soil doesn’t get too dry in the summer. Christine – Without more drainage/less shade it’s going to keep coming back. Walk in sharp grit into the algae.